Russia has reportedly commenced sea trials of its ultimate doomsday weapon, a nuclear-capable underwater vehicle (UUV), dubbed ‘Poseidon,’ purportedly designed to deliver a 2-megaton nuclear warhead to destroy naval bases, carrier strike groups, and entire coastal cities by triggering a radioactive Tsunami wave. The sea trials of the “Poseidon” began last week and are primarily focused on the UUVs guidance system and underwater operations in autonomous mode. Work on the “Poseidon” is reportedly progressing according to schedule, the Russian Ministry of Defense (MoD) said in a July 19 statement. The “Poseidon,” also known under Ocean Multipurpose System Status-6 or “Kanyon” by the U.S. intelligence community, “is a new intercontinental, nuclear armed, nuclear-powered, undersea autonomous torpedo,” according to the 2018 U.S. Nuclear Posture Review. The UUV is thought to have been developed in reaction to the increasing sophistication of U.S. ballistic missile defense systems. It appears to be a weapon of last resort to strengthen Russia’s nuclear deterrence posture vis-à-vis the United States and NATO. Torpedoes equipped with a nuclear propulsion system and fitted with a nuclear warhead for use over long distances were first conceived in the Soviet Union back in the 1950s. The nuclear-capable UUV has “primarily designed to destroy reinforced naval bases of a potential enemy,” the source added in May of this year. Despite having been officially revealed to the public in March, the Russian MoD has so far not publicly commented on the UUVs nuclear payload. 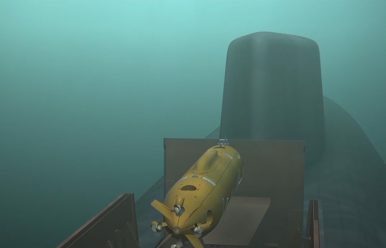 While the MoD did not reveal details regarding the UUVs sea trials it is likely that the “Poseidon” will be launched from a B-90 Sarov-class Project 20120 diesel-electric submarine—the only submarine of its class currently in service with the Russian Navy specifically designed to serve as a testing platform for new military hardware. Apparently, sea trials have kicked off ahead of schedule, although it remains unclear to what degree the UUV will be capable of autonomous operations over intercontinental distances given the multitude of technical challenges that likely will still need to be overcome. Various analysts have speculated that the ‘Poseidon’ UUV will not move beyond the prototype stage as it is principally designed for political purposes to initiate talks about anti-ballistic missile defenses with the United States. According to a March 2018 statement by U.S. Defense Secretary James Mattis, the nuclear-capable UUV, “does not change at all the strategic balance,” between Russia and the United States.